This gorgeous nine piece tea set features cherry blossoms, the national flower of Japan, on a white bone china surface. Detailed with 24 karat gold accents, it brings your tea time to life. Tea service includes a 43oz teapot, matching cups and saucers. Nothing could be prettier than this fine quality miniature porcelain tea set scaled just right for use with 18 inch dolls or tea set collections. 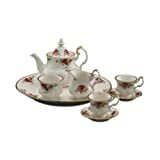 This porcelain fine china set is created in the Antique Rose pattern and includes a teapot, sugar and creamer set, and 2 cups and saucers. 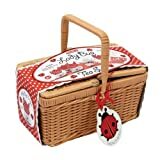 All are attractively stored in a coordinating satin lined keepsake box for safe-keeping. Tea pot measures 3.5" H. Coordinating child's size tea set sold separately. Exclusively made by The Queen's Treasures®, offering the highest quality 18 inch Doll Furniture, 18 inch Doll Clothes, 18 inch Doll Shoes & 18 inch Doll Accessories! Safety Tested! Gracie China's Vintage Blue Rose Collection, by Coastline Imports, is lovely porcelain which can complement the kitchen, dining and living room. Vintage Blue Rose, 11-piece Tea Service, includes Teapot, Sugar, Creamer and Four 7-Ounce Cups and Saucers. Gracie China's Rose Chintz Collection, by Coastline Imports, is lovely porcelain which can complement the kitchen, dining and living room. Blue Rose Chintz 11 Piece Tea Service includes Teapot, Sugar, Creamer and Four 7 Ounce Cups and Saucers. Gracie China's Butterfly Collection, by Coastline Imports, is lovely to entertain with and everyday use. 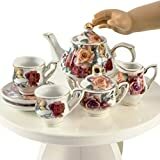 Porcelain 11-Piece Tea Set, includes 4-Cup Teapot, Sugar, Creamer, Four 6-Ounce Scalloped Edge Cups and Saucers, Gold Trimmed. Tea anyone? The Lady Bug Porcelain Tea Set from Schylling Toys, the world leader in traditional toys and classic fun, adds beauty and color to your tea party. Invite all your dolls, or your best friends, to join in as the hostess serves tea and goodies in the garden. This 13 piece set includes 1 tea pot with lid, 1 sugar bowl with lid, 1 creamer, 4 cups and 4 saucers. All of these pieces are beautifully adorned with beautiful Lady Bugs. For Ages 8+. 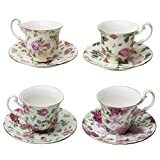 The best-selling dinnerware pattern in the world, The old country roses pattern is practically synonymous with the name Royal Albert and a long-standing testament to timeless style and elegant craftsmanship. The Le petite 9-Piece miniature tea set, is meant for display and features: 2 teacups, 2 saucers, a teapot with lid, creamer, sugar bowl and a trays; all decorated with the Old country roses' Signature motif of burgundy, pink and Yellow roses, accented with lustrous gold banding. Gracie China by Coastline Imports, is lovely porcelain which can complement the kitchen, dining and living room. A Set of 4 Tea Cup and Saucers with Gold Trim.